Sean Dyche felt his side did enough to win their FA Cup third round tie at Sunderland. But he was frustrated to leave with a goal-less draw and injuries to Scott Arfield and Johann Berg Gudmundsson. The Clarets avoided defeat away from home for only the second time all season in all competitions, but that first win on the road remains elusive. 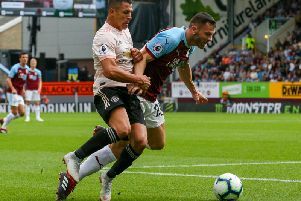 Burnley had more than enough chances to have won the game, however, and Dyche was encouraged by the performance from a side with six changes, including a second debut for Joey Barton. Dyche said: "I think chance-wise we're frustrated not to win it, I thought we made three, four even more promising opportunities, but two or three really golden opportunities. "On another day I think we win the match. "We made some changes, I was really pleased, I think we're working with a squad where there's fine margins between the players, and I'm pleased with how the players handled today. "We were on the front foot, that's how we want to play home and away, a lot has been made of our away league form, but you can see we want to take the game on and win games, and that was evident. "I was really pleased with the mentality, particularly as the game went on, I think we looked really fit and strong, and looked like we were trying to win the tie. And he was pleased with Barton, who came through 90 minutes looking strong, having not played since September: "I thought Joey did well, I thought his fitness was good, it's not easy coming in after the break he's had, he stayed calm with the ball, Steven (Defour) got through his first 90 for the club, which I'm pleased about. "I thought he gathered pace as the game went on, which is pleasing, him and Joey. "They began to control the midfield as the game went on. "I'm super pleased with the fitness of the lads, who haven't been playing regularly - Tendayi (Darikwa) particularly, fantastic to come in and play like he did, physically, and to play and handle it...Tarky (James Tarkowski) of course, players who haven't played a lot of football this season, but they've shown they're ready when called upon. "And obviously for Popey (Nick Pope) it's his first start, he gets a clean sheet and was pretty quiet, but still made a good save for us. He's a good keeper, we like him, he's learning all the time, his kicking was good, and he's a giant of a lad. I like the way he played with an assured manner. "There's a lot of positives." On the downside, were hamstring injuries for Arfield and Gudmundsson: "I'll have to wait and see on them. It looks like two minor hamstrings, but we'll have to wait and see. It will be Monday realistically. That's the only niggle really, we possibly have two players down." Jon Flanagan, George Boyd and Patrick Bamford were missing from the 18 and Dyche explained: "Flanno and Boydy with just a niggle, I don't think it's a worry. Flanno trained on Friday but it was just too quick with his history with his knee, so it was the right thing to do.